We're proud to have been selected among the best tour operators for travel to San Blas Islands and for boats to Panama-Colombia. We had found their web page looking for an accommodation for the San Blas, once we arrived in Panama City, we went directly to their office (you can also book online on their page). We have found a kind and very prepared staff, they describe the San Blas with absolute passion. We personally booked the tour at Cayos Holandeses, describing it by word is really difficult, you have to go there to understand the paradise that is. The accommodations are basic, on the islands could improve the attention to the customer, there was really a lot of people in this period, we understood and we enjoyed this corner of paradise. We recommend it to all people who want to discover a corner of pristine paradise. Il nostro contatto Simone ci ha spiegato molto bene lo spirito che bisogna avere per passare alcuni giorni ospiti della tribù dei Guna. Semplicità nell’accoglienza, alloggi spartani e servizi in comune. - portatevi dietro acqua frutta barrette energetiche ed una tazza per la colazione. Le spiagge sono molto belle, soprattutto Cayo Holandese. I visited these island with my girlfriend for a short two days trip and I would have wished I could have planned for more days. The ocean, the food, the hospitality, the environment, everything was exceptional. I would recommend to visit San Blas islands in your trip to Panama and I am sure you will not regret it. I went to Chichime Island with a friend last month for three days and two nights which was 180USD (totally worth it - transportation included and 6 meals). I highly recommend San Blas Dreams! Before booking the trip they answered all my questions via WhatsApp. The pickup from our hostel was on time at 5:30am, from there we went to pick up the rest of the people (4), then went to the groceries before heading through the jungle. All that took around 2-3 hours. The roads got windy at the jungle so I would recommend taking some pills if prone to car sickness. The driver took it easy on the windy roads which helped us enjoy the scenery. Then we arrived to the dock where we payed our 50$ in cash to the driver. This was where we took our boat to Chichime Island which took about 45 minutes to an hour. Everything went smoothly. Once we arrived we paid the remainder. The Island was spectacular! It was as advertised: beautiful, simple and rustic! If you’re looking for a 5 star lodging this isn’t the place. We lived in a hut which was an awesome experience! The whole island takes about 15 minutes to walk around and plenty of area to relax. There’s a section of the island where there isn’t wind which is a great place to tan, lie down on a towel and enjoy the island! We met a few couples there and spent most of our time with them! The food was awesome - just fresh seafood of the day: fish and lobster. Included in the package was a tour to the Piscina Natural, Isla Fragata and Isla Perro which we’re all very beautiful! The Gunas took great care of us and it was amazing to see their way of life something I’ve never experienced or seen in my life. It was neat! This trip was the real definition of disconnecting as there is no WiFi. For myself my friend three days was more than enough time. Thank you San Blas Dreams for making this trip go smoothly and memorable! The trip was amazing! This travel agent is a true professional. If you're traveling to San Blas and want an authentic experience you should definitely use this travel company. A great travel experience !!!! We had a great time in San Blas. Let me start by saying - it is not for those who seek urban luxuries in their travel. Island infrastructure is very basic (read shared bathrooms, limited electricity)..
And the people at San Blas Dreams would try to do their best to make it as seamless as possible (from pick up at your hotel, transport to the jetty, island experience, etc., etc.). I am specially grateful for our coordinator Roger, who was constantly in touch, and even made refunds seamless (a couple of our friends had to drop out from the trip)..
Would be happy to return to these isles!! The sea of San Blas is the most beautiful that I have seen! Bello also the return to the origins imposed by the locals, we eat to survive and follow the rhythms of nature, they are the ones to manage their Islands, this is a very beautiful thing. If you are the kind of person who needs a bit of luxury, this is not for you. It's bumpy roads/boat rides, rustic accommodations, and simple food. For those of us who deeply appreciate staying on a beautiful little island in the middle of the Caribbean Sea, it is perfection! San Blas is a dream place and a major highlight of my trip!! I stayed 2 nights and would gladly stay longer. Have zero complaints about San Blas Dreams, they did everything as promised and I can recommend them with confidence! We booked 2 days /1 night tour on Ina's Island with the San Blas dreams agency through their web page, about 1 week before arriving to Panama. The procedure was easy, we received confirmation with all needed informations within a few minutes. A day before departure we received also an e-mail reminder from the agency. They were absolutely easy to work with, all informations were helpful and correct and I would definitely recommend them. Everything was well organized. The driver was on time at our hotel in Panama city at 5.30 in the morning, we picked up 2 other tourist from another hotel, then we stopped at the market to buy some snacks, fruit and water, and at 06.00 we were on our way We drove about 2.5 -3 hours on quite an awful road, up and down the hills, you feel like you're in roller-coaster ride. It was a ride full of adrenalin and fun, and still we felt safe. When we arrived to the port, our Guna guide already waited us with the boat. The boat ride was one of the craziest I've ever been on . The waves were quite rough and the boat was almost flying in the air , so we were all completely wet. We had a smaller backpack each (we left our big bags in hotel in Panama city ) . Our backpacks were stored under the boat, so they didn't get wet. Bigger backpacks were stored on the boat, however our guide put them in a big plastic black bags to keep them dry. Make sure that you protect your passport, documents, money, mobile phone etc... before the ride. Put them into some plastic bags, so you don't have to worry and enjoy the ride, it's fun! Cabanas are very basic and simple with shared bathrooms, you sleep on beds in a dorm with sand or wooden floor and you be prepared to share your room with a few geckos ... do not expect anything luxury, do not expect wi-fi or ATMs. Expect simplicity and enjoy pure and beautiful nature! Thank you San Blas dreams team for great adventure and thank's also to Guna’s for protecting their lands against massive tourism . San Blas Islands are some of the most beautiful places I ever been. THE MOST FUN TROPICAL RATCHET EXPERIENCE! San Blas Dreams did a great job accommodating me and my friends to Chichimecas island. They picked up up at 5:50am and we finally arrived on the island at 11:05am, but it was all organized and totally worth it. My advice is to make sure you don’t sit at the very back of the pick up Jeep if you are tall or big. It’s cramped back there. Also recommend to wear water shoes when exploring during the scheduled activities. I stepped on a conch shell and bled everywhere, but thankfully the boat handler was able to sanitize me and secure a pressured bandage in time to be able to still enjoy the rest of the trip. The huts were comfortable, just be careful with fire ants and hang your food from the ceiling and it’ll be fine. The beaches were so beautiful and the hammocks were relaxing. Totally worth every penny, would go again!! The islands were truly amazing! But this review is more to do with San Blas Dreams the company. The staff in the office were the best service we experienced in Panama! Responded to my endless questions on WhatsApp and were so professional and friendly. The service was delivered just as it is described. Unfortunately my husband lost his wedding ring on the Island and I can not sing enough praise for the professionalism and help I received from Roger, the manager, helping me get a report and sort everything out for our insurance. Highly recommend this tour company! Great value and highly professional! El lugar es tranquilo, es acogedor y tiene un encanto natural al no haber grandes comodidades. si te gusta despertar mirando el mar y levantarte y pisar la arena es lo tuyo. a mi me encantó, nos fuimos por 2 noches y 3 días. La información respecto del costo es clara y a mi parecer vale la pena sin duda. Lo que no es claro es la cántidad o peso que uno puede llevar y al consultar en nuestro caso a la agencia nos dijeron que evitaramos llevar equipaje, pero llegas al lugar y te das cuenta que llevan maletas gigantes y otras cosas que son bastante bulto. bueno en nuestro caso considerando lo señalado dejamos nuestra maleta en el "hotel Wyndham Garden Panamá Centro" con toda nuestra ropa y sólo nos llevamos el pasaporte, la cámara, ropa ligera y el traje de baño , considerando que nuestra maleta podría ocasionar problemas en el bote. Bueno con pesar al hotel, nos dicen que nuestra maleta no estaba y que la había entregado a otra persona, nos había robado la maleta y perdimos todo absolutamente todo. Me parece que si fuera claro San Blas Dreams respecto del equipaje, tamaño, peso que se puede llevar, uno podría evitar robos en el hotel como lo fue en mi caso ( no eramos del país, alojabamos en el hotel que nos robaron). Al regreso del tour el chofer iba a 120 km por hora sin importar que ibamos 5 personas en el vehículo. Fue grosero y muy mal educado. no recuerdo la patente, pero esos detalles hacen que uno evite recomendar de inmediato a la agencia. Uan Empresa la hacen las personas. El lugar es bonito, pero me parece que falta claridad en lo que señalé respecto del equipaje y mejor atención e información. What can I say, the San Blas tour was absolutely wonderful, and so much more, than we expected. So many experiences and amazing islands, beautiful beaches.I would highly recommend this tour to anyone. Are the best, thank you so much. Kristen from Germany. One of the best, most relaxing days of my life sailing in paradise! 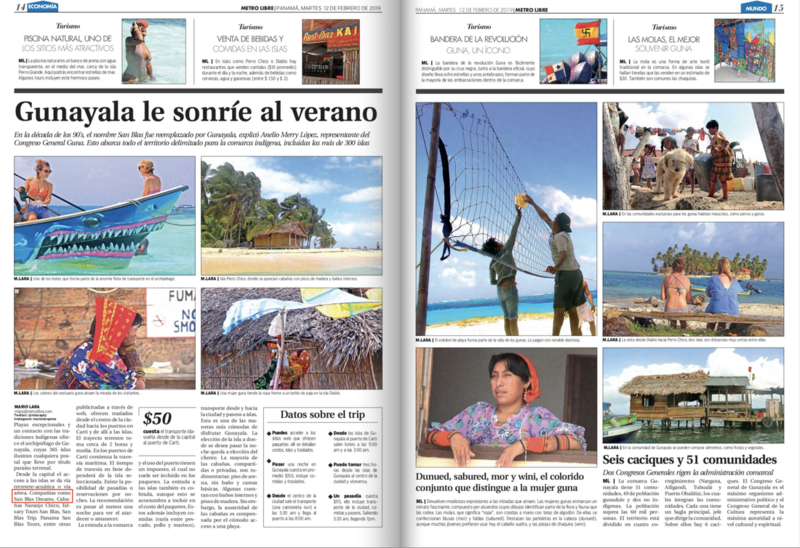 Amazing beaches, crystal clear water, awesome tour and It's great to know the Guna Yala culture. It's good to know that it's all very simple, shared bathrooms, Guna's typical kitchen, nothing luxurious. When I arrived in Panama I had 3 options for my trips and I found San Blas Dreams the best. They have Tours in the different Islands of San Blas, I chose the tour "Cayos Holandeses Adventure"... WONDERFUL. I'm very thankful to these guys because they helped me to plan this tour. I highly recommend this agency in Panama City, go to San Blas and enjoy it. Everything was well organized. We bought a trip to Isla Ina for 2 nights. The driver was on time at my place. On the island also everything was ok, we had accomodation in private room and the food was good. On the way back the driver also was on time and took us to the set up place. I can really recommend tour to this island because it's amazing experience. Well organised tour with good transport and accomodations (very basic). This as a great way to see the San Blas Islands. We celebrated by birthday at the San Blas, it was amazing. I would recommend it to everyone. San blas tours island more "El Machico hostel" : the best choice !!! The tour in the San Blas was simply amazing , you leave the hostel with a private car at 5.30 in the morning and in 2 hours and half you arrive in the little port in Cartì where the boat is waiting to you to get in the island you have choose,At 11 more or less you will stay lie down in the ammock with an amazing view. ( don't forget your passport). -The room in the island are basic but functional. -You have also included in the package three different places to visit around the island with boat. -the owners of the island( I Guna ) keep the island clean, please don't forget the trash in the island but keep with you and put it in the basket near the reception in the island. -If you need a very good hostel in Panama City don't forget to book your nights in "El Machico Hostel" , the owners are the same of this agency.They are from Italy and they can help you for eveythings you need because they know really well Panama City and Panamà country. If you stay in Machico hostel before to leave from the hostel to the island don't forget the delicious breakfast(Pancake with chocolate,fruit,thè and coffè) included in the price because it starts at 5 in the morning especially for those who have to leave early morning. Good value for money amaziing place !!! Si buscas playas de ensueño, paisaje paradisiaco, hacer snorquel y tranquilidad, no lo dudes estas islas te maravillaran. Nosotros estuvimos en Chichime, queriamos algo rustico y poco visitado y fue justo lo que encontramos. Viaje con dos niños y ningun problema, los servicios son basicos pero no necesitabamos mas. Nos hubieramos quedado a vivir con los Kuna en su tierra maravillosa. Von der Organisation her hat alles gut geklappt. Hatte vorher Kontakt mit der Agentur per WhatsApp, um noch was zu klären. Der Mitarbeiter war super nett und hat mir geholfen. Die Insel ist sehr schön, ein Traum in der Karibik. Türkises Wasser, weißer Sand, Palmen und Hütten direkt ab Strand (Sandboden, Bett, Lampe und Strom von 6-23 Uhr). Es gab zwei kleine "Dörfer" zu denen man per Zufall zugeteilt wurde. Bekannte wurden so voneinander getrennt, man läuft aber nur 5 min. Betrieben wird das ganze von 2 Familien?! die sich anscheinend nicht mögen. Für 20$ extra konnte man anstatt morgens um 8 bis nachmittags um 3 bleiben, laut Veranstalter inklusive Mittagessen. Der Chef unserer Familie wollte dann pro Person 15$ extra fürs Essen, unverschämt. Er scheint sich daran wohl unabhängig vom Veranstalter bereichern zu wollen. Trotz Diskussion war er nicht bereit das Angebot des Veranstalters zu akzeptieren. Wir hatten also nur das eh schon zu kleine Frühstück. Geschmeckt hat das Essen aber trotzdem. 3 Days in Paradise !!!!!!!!!!! I was recommended this tour by my sister who did the same tour 2/3 years ago, so I did very little research myself on both the tour company of the country. The trip has not disappointed, it has been a great experience and I have loved both the San Blas Islands and the tour company, really helpful staff, Rogelio super!!! Probabilmente il mare più bello visto nella mia vita di viaggio. Uno straordinario paradiso e una perfetta organizzazione in collaborazione con la popolazione indigena. Stupendo! The tour is well planned and we all had fantastic time ! Everything was great all the places are amazing, the islands of san blas are a paradise. Thank you for one of my best vacations. Booked through el machico hostel of Panama City. They helped and advised us really good on which island to take, in our case Chichime, strongly recommended! We spent 2 unforgettable days. Great experience and fantastic memories. The whole experience was fantastic!!! The San Blas Islands are fully in control of the native Kuna’s. The Kuna’s protect their lands against massive tourism and keep them healthy and beautiful. Very simple huts, shared bathrooms, do not expect anything luxury! My husband and I can't stop talking about how great it was this place. There were so many aspects of the trip that were remarkable. We were overwhelmed at the beautiful beaches and crystal clear water of the San Blas Islands. We were amazed by the people Kuna (Guna), their culture and their customs. Excellent Trip, I would recommend it to everyone! Isla Ina & Isla Estrella, dos de las 365 islas que se encuentran en San Blas, mi experiencia aunque en solitario fue muy buena conocí gente de varios países y a la vez un poco mas de mi pequeño Panamá. Un lugar paradisiaco de aguas claras en el que pude des estresarme de la ciudad y quedarme con las ganas de volver y recorrer las demás islas pues de seguro cada una será mejor y mas diversa que las otras. Aunque mi paquete fue de solo 2 días lo disfrute enormemente. Lo recomiendo mucho si lo que buscan es desentenderse de las dificultades personales,del estrés y de la rutina o monotonía. The whole experience was fantastic!!! Stayed 2 nights in Ina's island and really enjoyed our time. Food was delicious and servings were generous. The community on Ina's island work very hard to ensure we enjoyed our stay. Accommodation was basic but we treated it like a camping trip and had lots of fun. Tour of the islands was also very impressive. En Tripadvisor encontramos esta agencia de viajes para las islas de San Blas. Inmediatamente nos gustó sus recorridos con excelentes precios. Después de varios correos electrónicos con los chicos (que fueron muy amables), decidimos reservar en su página web, abono con tarjeta de crédito. El paquete elegido fue de 3 días y 2 noches, todo muy bien organizado, en San Blas no hay instalaciones de lujo, todo es muy básico ... pero lo importante es que las islas de San Blas son un PARAÍSO. Es difícil de decir ... sólo verlo se puede entender !!! Si va a viajar a Panamá, debe visitar necesariamente estas islas. Recomendaría reservar con esta compañía. The trip to San Blas was absolutely fantastic! We had an amazing time exploring Chichime Island, Perro Chico, and Natural Pool. I highly recommend this tour. The agency "San Blas Dreams" helped us book this tour and were very receptive to emails/calls while we were not in Panama. They are absolutely fantastic to work with and I would love to work with them in the future! We had a great trip. We visited 4 islands in 2 days and all of our reservations, documentation, transportation and tours were executed flawlessly. This travel agency definitely knows the San Blas Islands. Staff (Javier) really helpful. The San Blas Islands are definitely a paradise. We are very happy with our decision to use this travel company and I would also use again. La mejor decisión, cuando planifiqué mi viaje a Panamá no tenía la menor idea de lo que San Blas significaba, cuando puse un pié en la Isla todo tuvo sentido. Aunque las personas que me vendieron el tour no me explicaron nada, aquí les dejo un consejo; lleva repelente,agua para beber, cervezas, snakcs, enlatados, frutas y muchas ganas para vivir una aventura. Reserva 2 día y 1 una noche, únicamente con un tour por otra isla mas, 3 días 2 noches, reserva al menos 3 tours. No se necesita compañía, amigos se hacen en el camino.